There is no denying it, I am the best vintage mobile bar in Perth. Not that I’m biased or anything! I know I have that vintage caravan vibe going on. 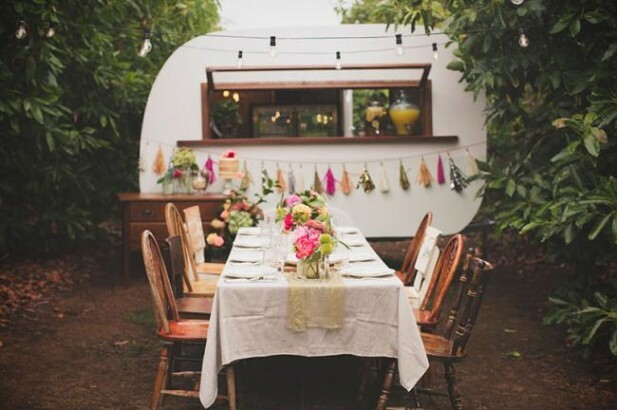 As a mobile caravan with flair I love to admire others with a similar love for all things vintage. If you aren’t located in and around Perth and you’re looking for something similar, here are seven of my favourite vintage mobile bars in Australia. Introducing my vintage brothers and sisters. Mable & Co is a vintage caravan after my own heart. Like myself and Poppy she was in need of some TLC after a life travelling the globe. Now in her twilight years, she has been given a facelift and has retired to the Margaret River Region. Mable – an old English name meaning ‘lovable dear’ – provides “vintage sophistication with a little whimsical charm”. She features local Jarrah timber, a VIP leather lounge area and a beer fridge. I think she is as cute as a button! Well, Hello Mr Jenkins! Aren’t you a dapper chap, just like me? This is certainly true when you look at Mr Jenkins a 10ft,1952 home built vintage caravan. He oozes style, character, sophistication and charm. Like most of my brothers and sisters, he too had a serious makeover. His interior was completely gutted and refitted with a solid wood bar, ice sinks, bar fridges and a leather seating area for up to 4 guests. Just like old Mable. Spencer’s the name, caravaning’s his game. He likes to show his guests a ruddy good time! Spencer, named after the fabulous Charlie Chaplin – otherwise known as Sir Charles Spencer, is a true showman. He was built especially for owners Sarah and Alex by Woody Caravans. 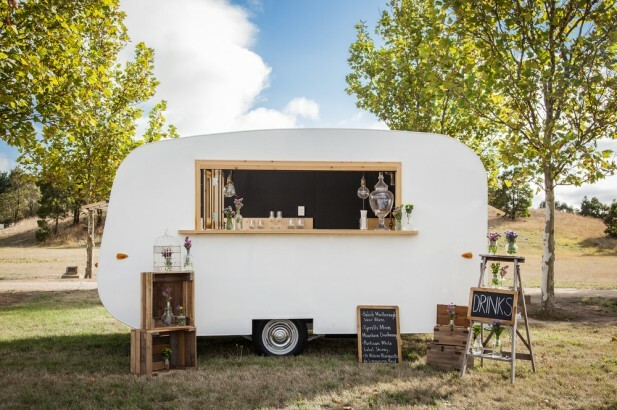 Having purchased him for their own wedding, they decided to turn him into a vintage mobile bar for others to enjoy. Spencer serves bubbles, beer, soda and cider for man showers (like a baby shower except for the boys) and other types of social gatherings. The Hutch are entrepreneur’s after Katie’s heart – my owner. Not only do they provide a vintage mobile bar, but a range of other event services including stationery, floristry, cakes and photography. An all-round vintage experience – or one-stop shop if you will. But I’m here to talk about Travs – their vintage caravan. Handsome isn’t he! He must take after his older brother. Travs was the brain-child of his owner Diane. 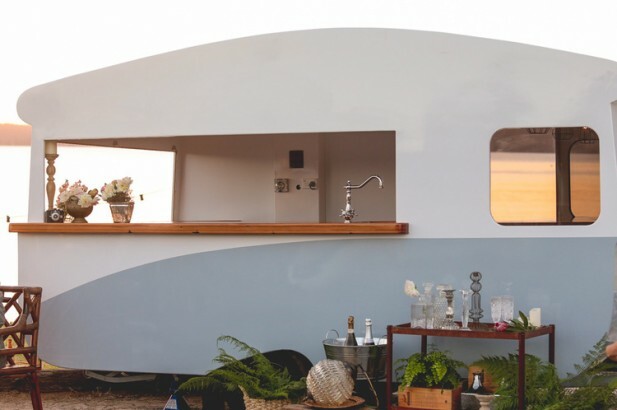 She combined her passion for vintage and love of caravans to bring him to life as a vintage mobile bar. Diane was tired of lugging around all the equipment that went with setting up a bar. So she got Travs on his feet to run things. And what an outstanding job he does too. May I be so bold as to introduce Tom Collins? Tom is a handsome chap who loves to party. He was rescued on a dark and stormy night from being sold on eBay to some random stranger. Once he’d been through a complete overhaul on his tired body he was put to work. His name? Well, that’s easy. Named after a hoax that was doing the rounds in New York in 1874, the Tom Collins immortalised itself into one of the most iconic gin cocktails around. Being a lover of cocktails his owners had to name him after this well known alcoholic beverage. What a snazzy name it is. Pleased to meet you Gertrude. A love affair between two quickly turned into three when a husband and wife duo bought Gertrude for their own wedding. Being born in the 1950s Gertrude also needed some restoration to iron out the cracks. She now boasts a beautiful baltic pine bench top, stainless steel sinks, striking brass light fittings and a beautiful blackboard wall for guests to write messages on. Gertrude is the perfect ingredient for any special event. Last, but certainly not least, there’s Olive. Olive loves an adventure and happily roams between Bellingen and Byron Bay, providing vintage charm to everyone along the way. She’s not shy. Not only is she a bar, but she doubles up as a café as well. She serves a mean slice of cake, does Olive! Boy, I miss her cakes. Like myself, she does all the events in and around town. Her imagination is endless and so is her heart. I thoroughly recommend her. Allow Me To Bring Vintage Charm To Your Next Event! Hoffman At Your Service. Just give me a tinkle on the telephone for a quote, or visit my websites Weddings and Events page for more information. I’m looking forward to serving you. Swinging 50’s vibes, bubble machines and pink flamingoes is what Hoffman Mobile Bar is all about. These are all the things that sum up my business and make it successful. But getting to this point was a real labour of love, let me tell you! Here is my story of how I gave birth to my fantastic vintage mobile bar idea. It all starts with Delish Ice. For a long, long time I had a yearning to start a business. There was entrepreneurial spirit in me that just kept niggling away until I found something tangible to pursue. I was always coming up with little hair-brained schemes in my head but nothing quite stuck there. Then one day back in January 2010 something sparked in my head as I picked up a copy of Donna Hay’s magazine. It had popsicles on the front cover and my brain kicked into overdrive. The ice pops looked delicious. They would be easy to make, would keep overheads to a minimum and I loved food. Wow! This could work I thought to myself. Having done some research I quickly found there was no one else in Western Australia producing handmade artisan ice pops. Or even in Australia as far as I could see. I thought about my weekend at Southbound a couple of years earlier – trying to set up a tent on a scorcher of a day and nearly getting heatstroke – and I realised popsicles would be great at music festivals and other events to help people keep cool. I was on to a winner! Following my ‘eureka’ moment I spent the next 6-7 months in the lead up to the following summer building a business plan to prove I could turn it into a full-time business. This involved importing the moulds and a special freezer, getting my branding done, creating a website, finding and renovating Poppy (my small vintage caravan), getting health approval, looking for events and testing out ice pop recipes. Time ticked by very quickly with so much to do and it was soon December 2010. With my little engel freezer filled with ice pops, Dad and I drove down with Poppy and set up for my first gig – the Margaret River Farmers Market. I was so excited! From that moment on I knew this was my future. To say my business took off was an understatement. With so many summer events in and around Perth to peddle my ice pops at I was kept extremely busy over the next couple of years. During those two years I was running my business from Margaret River. But with a large portion of my events closer to Perth I decided to relocate to Fremantle. The business kept growing and growing and I was soon having to turn down events. Something every business owner hates to do. It was clear I needed another caravan… and fast! A browse on Gumtree one day proved fruitful. I saw a big old wooden caravan in Northam that was being sold, but needed some TLC. Ben, my carpenter cousin who has been an amazing supporter of Delish Ice from the start, suggested I should buy the van and he would renovate it. It was a massive labour of love. After a few months of hard graft Hoffman was ready to rock n’ roll. Peddling pops was not all that Hoffman was good for. Like a true entrepreneur I quickly realised he could be utilised for two purposes. Peddling ice pops by day and a mobile bar at night. This would bring another revenue stream into the business. Perfect! I had a keg system installed and gave him his own personality. Now poppy has a big, dapper boyfriend who moonlights at weddings and parties as a mobile bar. I can’t deny that getting to this point hasn’t been hard work. The biggest challenge for me has been looking after myself and trying not to burn out. I haven’t been particularly successful with this, but I’m getting better at it. When you get overworked it’s easy to get overwhelmed, sensitive, emotional and question yourself. As a business owner and entrepreneur it’s an emotional roller coaster as it is. My advice to anyone looking to follow their business dreams is to be strong, stay focused on your vision and have confidence in yourself. There are ups and downs but you get through them. A particular challenge I am facing at the moment is to learn how to distance myself from my phone and my computer when it’s time to relax. Taking time out for myself, my partner and my friends and family has become particularly prominent for me recently having worked solidly for the last five years. Having a good team of people around me who can take the strain helps immensely. The first five years of owning your own business is the toughest. Key tips for survival include making a commitment, having a long-term plan and planning for success. You also need to be open to new ideas and don’t be afraid of change. Change is good. My business has grown and evolved significantly over the last five years. That really excites me because I think about where or what it will be in another five years time. Who knows! Relocating. Moving from Margaret River to Fremantle has brought me closer to the city and all the action. My branding. I used a crowdsourcing website for my first logo because I didn’t know any better at the time. It was fine at the beginning, but then I really started to detest it. It became embarrassing. I know that branding looks to be an expensive investment but I cannot stress enough the importance of a great brand. Getting hired help. I used to do everything myself.. well, mostly. I have had some truly amazing and supportive friends and family that have been invaluable from the beginning. As the years have progressed I have tried to take myself out of the business more and more, so it is not so reliant on me. I have a great team around me now. In the kitchen, at events, social media experts, bloggers, administration, bookkeeping and mentors. If you are struggling to do things alone just start out small. Get confident in handing tasks over to people and you’ll soon see the results. It’s worth it! Let me tell you, there is no typical day when you own your own business. But that is obvious, right? I would like to have a better routine in my life, but I haven’t managed it so far. During the week I am making pops, cleaning the vans, answering emails, talking to clients and event organisers, getting ready for the week ahead. At the weekend is when the events kick in. Markets, festivals, weddings and parties, you name it we do it! The best part of my day is meeting new people. Seeing our loyal customers who have been with us since the beginning is always a pleasure. It’s what makes my job fun. I run a business where I get to create delicious treats, go to different places around Western Australia, hang out in vintage caravans in pretty dresses surrounded by pink flamingoes and floating bubbles. Pretty amazing if you ask me! Wow! It has been quite a journey when I read this post back. A rollercoaster of a ride with lots of fun, adventure, hard work and some tears. Lots of happy memories, but with plenty more to come. That, I can be damn sure of. Where I will be in five years time I don’t know, but I know it will be fun getting there. 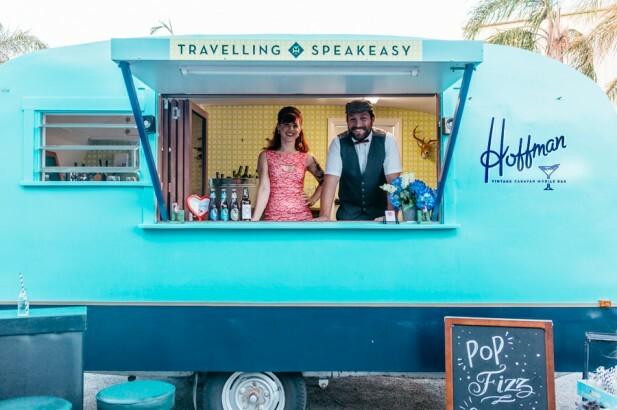 Why not hire Hoffman Mobile Bar for your next celebration? From weddings to parties, corporate events to brand activations, we’ve got you covered. Contact us today to find out more, or visit our Weddings and Events page for more information. With a summer wedding comes the heat, so it’s important to keep your guests happy by providing refreshments after a long ceremony in the sun. But, you don’t just want any refreshments it has to be something special. 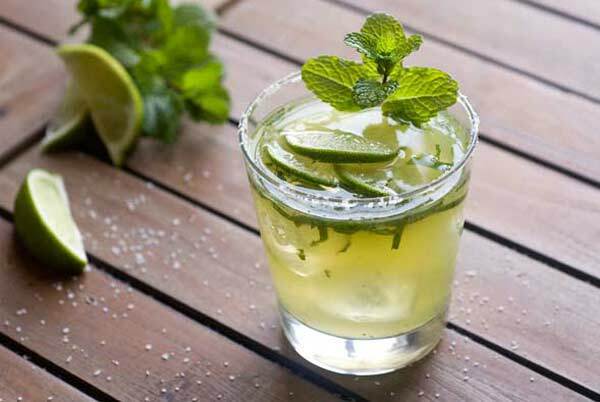 With that in mind, Hoffman’s expert mixologists have put together five cocktail recipes we think are perfect for cooling your guests down. 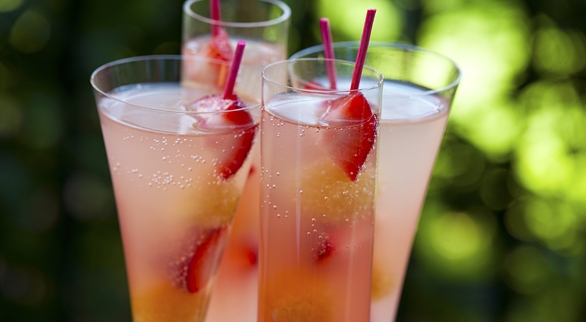 These bright pink cocktails bring a wonderful piece of colour to your wedding. Containing fresh fruit, basil and ginger they are guaranteed to provide a delightful zing of summer freshness. 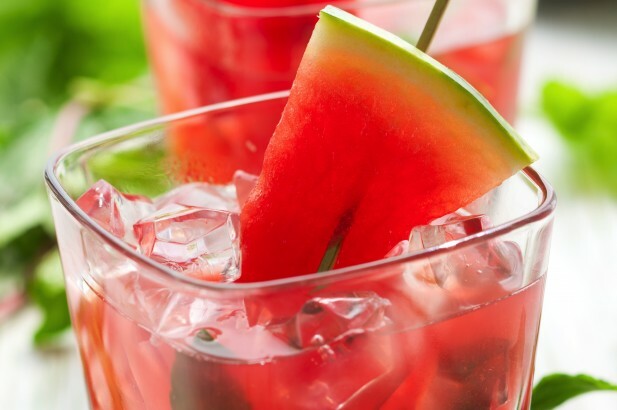 For the watermelon-strawberry juice, blend equal amounts of watermelon and strawberries. Strain the juice through a fine-mesh strainer into a pitcher or large measuring cup and refrigerate until needed. For the basil-ginger syrup, you’ll need one of cup water, one cup of sugar and one two-inch piece of ginger – peeled and thinly sliced, plus a handful of fresh basil. In a saucepan, heat the water and sugar over a medium heat until the sugar is completely dissolved. Add the ginger and basil, and immediately remove from heat, allowing it to steep until cool. Strain the syrup into a jar through a fine-mesh strainer and refrigerate. This will give you approximately one cup of syrup, and will keep refrigerated for two to three weeks. Add all these ingredients to an ice filled shaker glass. Shake and strain over fresh ice, then garnish and serve with a specialty straw. Makes 4. 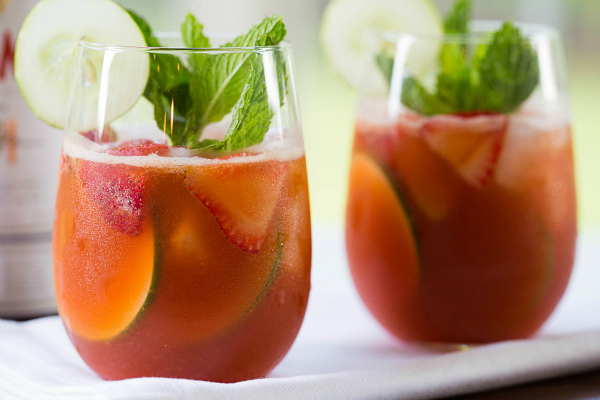 Pimm’s is one of our favourite cocktails to serve on a hot summers day. The added mint, cucumber, oranges and strawberries will revitalise and cool your guests and it’s such an easy drink to make. Serve this at your wedding and your guests will be begging you for more! Fill a jug with ice and pour over the Pimm’s and lemonade. Give it a good stir then add the mint, cucumber and fruit. Pour into tall glasses with a garnish of fresh mint and a specialty straw. Makes 4. This recipe is pure summer in a glass. Selecting a good quality tequila will ensure you create the ultimate wedding cocktail. In the bottom of a large pitcher, crush together mint and salt, pressing with the back of a wooden spoon. Add ice. Add tequila, lime juice, and triple sec, stirring vigorously. Serve in short tumblers or wineglasses with a garnish of fresh mint. Makes 4. Summer is mango season, so why not kick-start your wedding reception with these tangy cocktails, spiked with vodka and Cointreau? These phenomenal cocktails are a party on your tastebuds. 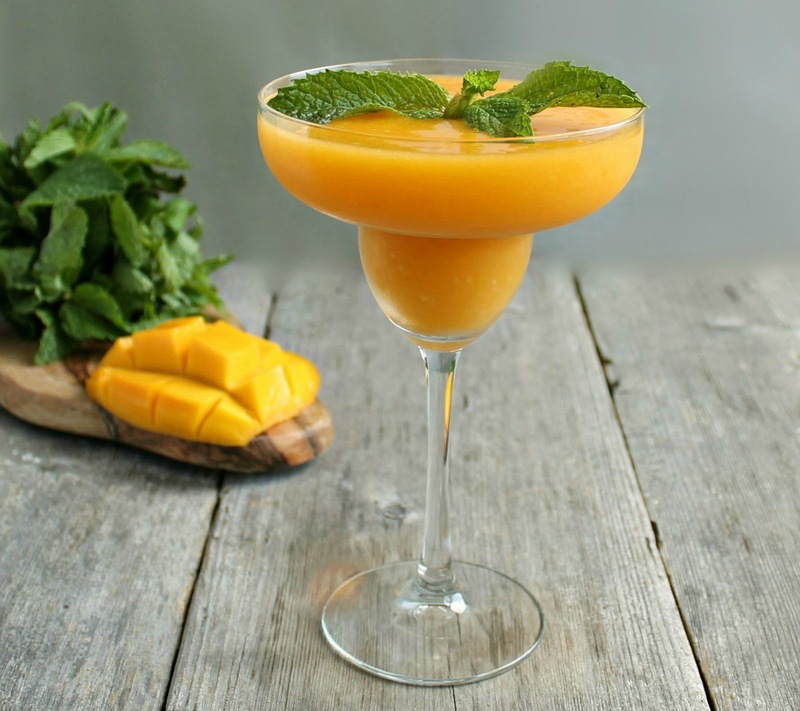 Puree the mango in a blender. In a large glass pitcher combine all the ingredients and refrigerate until cold. 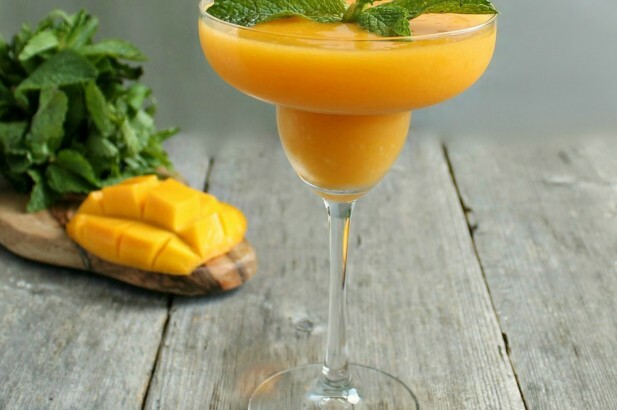 Serve chilled in cocktail glasses, garnished with fresh mango wedges. Makes 4. This breezy summer drink is bound to help your guests escape the heat and is perfect for cocktail hour. The Champagne brings a touch of class to this delicious drink. Fill a small jug halfway with ice and pour the grenadine, Cointreau, brandy, and champagne over ice. Stir gently, and ladle into wide-mouthed stemmed glasses. Garnish punch with raspberries, apples, or any other fruit in season. Makes 2. Don’t fancy making your own? 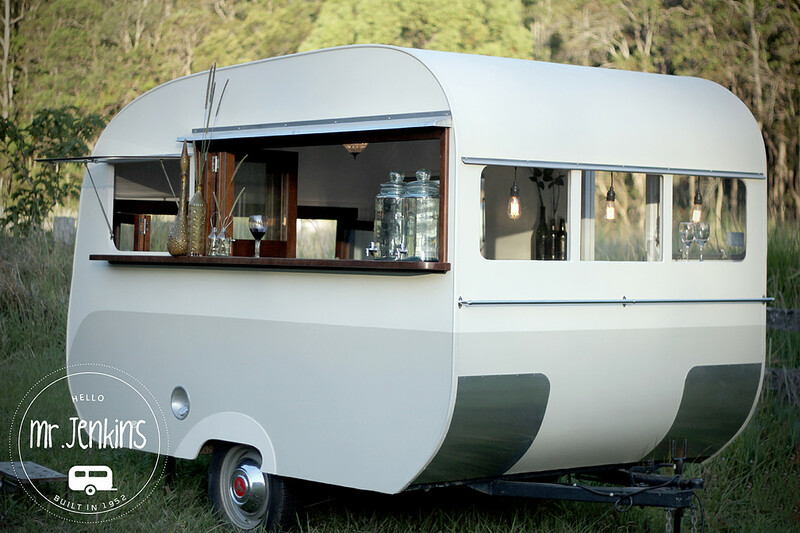 Let Hoffman Mobile Bar Take the Strain. Hire Hoffman Mobile Bar for your next wedding and let our expert mixologists create the perfect refreshments to wow your guests. Contact us today, or visit our Weddings and Events page for more information.